Harbord Street is semi-famous for its restaurants such as the elegant Splendido and Loire, modern bistros Messis and Harbord Room and gastropub Harbord House. 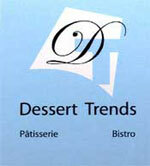 But the best kept secret is a café/patisserie called Dessert Trends, or DT Bistro. Located in a handsome building on the corner of Brunswick, it is an oasis of calmness and serenity with an Eastern aesthetic that is as joyful as the face of owner/Olympic chef, Don Doung. Go and enjoy very good espresso and croissants, perhaps the best almond croissant in the city. Soups, salads and sandwiches are tasty works of art, as are the desserts, homemade ice cream, wedding cakes and food products to go. Fantastic! Service can be slow – part of the experience. Closed Mondays. Open for dinner Wednesday to Saturday too!